being MVP: Creative Baby - I-Mat: My Animal World & Giveaway! 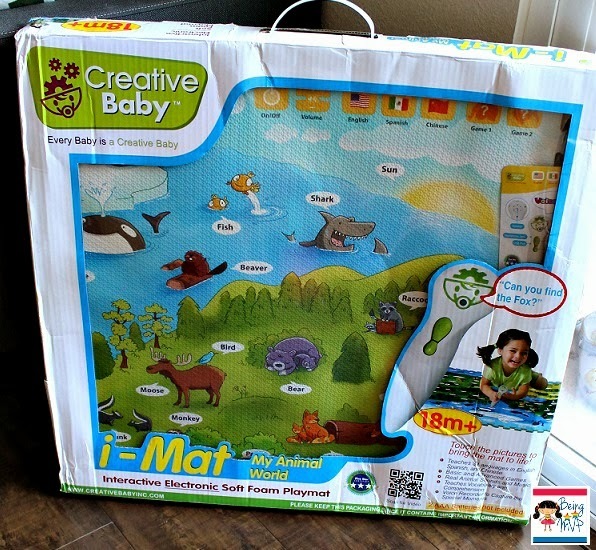 Creative Baby - I-Mat: My Animal World & Giveaway! I have gushed many times about how I love educational toys - especially ones that capture my attention as well as Kenzie's. Creative Baby sent us the I-Mat for review and both kiddos are huge fans. From the onset, it looks like a colorful foam mat that you use to keep little noggins safe from hard floors. However, cleverly disguised within the Creative Baby I-Mat are sounds, words and music that is activated by using the Voice Pen. When we first connected the four pieces of the mat, Kenzie immediately rattled off the names of most of the animals. Yes, I was surprised that she even knew the beaver! I borrowed the AAA batteries from the TV remote control and we were ready to learn. I showed Kenzie how to turn on the pen and point it at the USA flag for the sound to come out in English. The I-Mat can also be used in Spanish and Chinese as well. She had a blast pointing the pen to each animal and Mason enjoyed dancing to the funky music. It's great that she is learning and teaching Mason along the way. Although Mason is only 13 months, he is learning by repetition and even knows to hang the pen on Kenzie's playhouse door knob. I think in a few months he will be able to identify the animals much better than now. What do you think? The I-Mat is easily wiped down and durable - a must have for when you have little ones. I also like that you can break it down to 4 pieces for easy storage or transport to grandma's. Moreover, each piece of the mat works when separated - yes it does not have to be fully connected to have loads of fun. I wonder if I had two pens, both my kiddos can simultaneously use? My mother in law was amazed by the I-Mat and Kenzie showing her the capabilities that we may have to purchase an additional one for her home. Kenzie gets all silly when music comes on after the animal word. Check out her goof ball antics. Creative Baby has just released the Under the Sea I-Mat which can be used with the Voice Pen (just download the new sound file using the included USB cord). What's neat about these mats is that they can all most likely connect together and create a giant play area - these pieces can integrate into our current mat (if we had the floor space to accommodate, that is). This is definitely on Kenzie's holiday wish list as well as the anticipated My Alphabet Mat. Buy It: You can purchase the I-Mat My Animal World Set for $79.99. Make sure to connect with Creative Baby on Facebook and Twitter! One winner will Receive an I-Mat Set! I learmed that you can choose the lamguage. I learned about their study of baby's learning habits! I like that there are 2 choices for mats, I hope they continue to come out with more! You can chose between Under the Sea and Animals! My son would love this! I learned that they have free shipping on mats right now. I've learned that I have to order this mat if I don't win one because this is awesome and I know my daughter will have fun using this while learning at the same time! I've also learned that you can use this in three languages too! I learned that at Creative Baby they believe that a creative baby is a happy baby! I learned that you can change the language. I learned that the mat is spill proof and has different languages! Thanks so much for the fantastic giveaway! I learned that it not only identifies the animal but the sounds they make. What is great about this is that they can have a different language to learn how to say that animal in it. Such a neat way to learn a new language. I learned that you can add your own videos and pictures. I learned they have free shipping on the I mat's. I learned that they also have an Under The Sea mat. I learned that it comes in different languages! So cool! I learned that it is durable and spill proof. Which is perfect for my house. I learned that the pen has a headphone jack! I visited Creative Baby and learned that under the 'Resource Center' tab you can find a lot of info. The animals are listed in alphabetical order and each are linked to a resource page that will give you more information about the animal. What a great way for kids and parents to learn together. develop products to excite and entertain, to challenge and delight. I learned that you can choose from 3 different languages! I learned that it not only identifies the animal but also makes the animal noise as well. I learned that its also in spanish which I love because my whole family is hispanic so this would be an awesome toy for my little girl to had! I learned that it's spill proof (woohoo!). i learned its washable and i really like the under the sea mat! I learned that they offer two mats: Under the Sea and My Animal World! I learned that it also teaches the names of animals in 3 different languages! They have products that are fun and engaging even for really young children! I leaned they use real animal sounds. I like the under the sea mat, different language choices and that its washable. I learned that- To ensure real world practicality, we test our products with families all over the world to determine what works best in a family setting to engage parents, babies, and most importantly, parents and babies together. I learned that they have a Under The Sea I-MAT™. I really like it. It also has the option of english, spanish or chinese. How awesome is that? I learned that the I Mat teaches 3 Languages English, Spanish, and Mandarin Chinese. I learned that it has a voice recorder to capture the special moments! importantly, parents and babies together. I learned that you can use it indoors or outdoors.